Give the gift of five star dining within the comfort of home with this mouthwatering spread of surf, turf, and delicious coastal cuisine. Two Large Maine Lobster Tails. Two Filet Mignon 8 oz Steaks. Seafood Kit: Sea Shellers, Seafood Forks, Lobster Bibs, Moist Towelettes, Preparation Instructions. if ordered by 1:00 pm EDT Sunday April 28th. 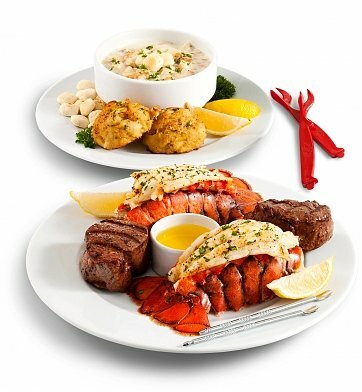 Filet Feast and Maine Lobster Tails Dinner is a hand delivered gift. These gifts are delivered by one of our local design centers located throughout the United States and Canada. Same day delivery is available for most gifts when ordered before the cutoff time. The cutoff time for Filet Feast and Maine Lobster Tails Dinner is 10 AM in the recipient's time zone. Ocean-fresh seafood, caught from 100% sustainable resources. They thoroughly enjoyed the delicious food and they said it was better than you%u2019d get in a top class restaurant! I have ordered several items from GiftTree and have always been completely satisfied. We ordered the Filet Feast & Maine Lobster Tails Dinner for our boss on Bossed Day - not only did it arrive as it stated - when he opened it and saw all that was in there he could not stop smiling!!!! That night and into the weekend he and his wife enjoyed several meals from this gift - since there was so much!!! I would highly recommend this gift for someone you hold in high esteem. I would order this again and again!!! My children's grandmother received this gift for her 7 decades birthday and she and her husband loved every part of it. She said the lobster and the filets were fresh and excellent. She even liked the included bib. She said the clam chowder and crab cakes were also wonderful. Thank you, Gift Tree for giving her such a fabulous surprise. It was also delivered right on time. Recipient said that it was the best lobster he has ever had. Everything was excellent. His only suggestion was a little sauce for the crab cakes would have been perfect. Wouldn't hesitate to order it again.